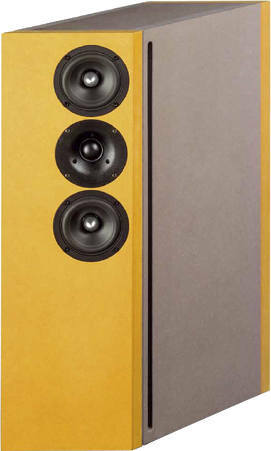 The Wega is an high-end 2 way bassreflex bookshelf speaker with deep crossover frequency. The base of Wega is a a parallelogram. The Wega is home to a Wavecor dome, the TW030WA12, and two low-distortion 12 cm mid-woofers Wavecor WF120CU07. Wega is developed by Daniel Gattig and Dennis Frank. The crossover consists of a 2nd order high-pass filter (12 dB per octave slope) for the tweeter. Two parallel RCL smoothing the frequency response of the tweeter. The Woofers are connected to an 2nd order low-pass filter. The frequency response of this speaker a very linear. The decay spectrum is nearly perfect. At low volume, i.e. 85 dB at 1 m, the nonlinear distortions are lower than 0.5% above 300 Hz and doesn't exceed 1.5% at 95 dB at 1 m .
Our high-end version employs ClarityCap capacitors; in series to the dome tweeter even of Type ESA. The coils are Mundorf copper foil coils or baked varnished coils for diminishing the microphonics effect. Current flowing through the coil creates a magnetic field which on itself sets the reel of wire in motion. That motion induces a voltage in the coil which adds itself to the original signal.